The following represents examples of his discussions on yoga, pranayama, sensitivity, intelligence and health. Yoga is the fashionable thing now. Yoga, as translated, means joining, yoking two separate things together. I am sure it had quite a different meaning at the beginning. Yoga meant probably harmony, not bringing two things together, the soul and the body. Yoga has been brought to the Western world to make people healthy, happy, young, find God. Originally, from what I was told, there was a certain leaf in the Himalayas which only very few people chewed, and it kept their brains and their minds tremendously alert. And as the vine or the bush disappeared, they had to invent a system called yoga which kept all the glands perfectly healthy, operating efficiently. And that is how yoga came into being, the exercises. Also in it is involved a moral way of life, not just doing some silly little exercises. K: The word yoga means to yoke, but it is a wrong translation as it implies duality. Yoga means unitive perception, to see the whole of life as one. The seeing of it as a whole is to act as a whole. To see the whole of life as one unitary movement is yoga, not standing on your head and all that. As human beings do not see the whole of life as a unitary movement, standing on your head breathing properly will help you, at least one hopes, to see life as a whole. Q: But would that help you really? K: Wait. First get the true meaning of it: not joining two things, the soul and the body – that’s all nonsense – but to observe, to perceive life as a whole, as a total unitary movement. Because you see it as a whole movement you act non-fragmentarily. Therefore your relationship is total. Not my wife, my husband, my family, my children and all the rest of it, but complete, as a whole human being. How is that to come about? Therefore they say you must breathe properly, etc., and perhaps that will then give you that. And then we get caught up in asanas. You exercise and forget the other, becoming lazy, self-centred. I am not saying you shouldn’t stand on your head. I do it. But that is not going to lead to the other. So when you see the importance of a life which is non-fragmentary, you won’t get caught in the asanas. You will do them, but you won’t be caught in them. Because by itself, doing asanas you might be terribly selfish and egocentric and lazy. One can see for oneself how important it is to have a physical organism that is independently intelligent, not chivvied about or driven by thought, by desire, by various pressures and strains, so that the body, the organism is no longer controlled, shaped by thought in its search for pleasure and the avoidance of pain or fear, and has the quality of great sensitivity and intelligence. So that is one part of it, the complete stillness of the body, intelligent, not disciplined according to the various psychological demands, various pressures so that the body becomes highly alert, sensitive, and therefore has its own intelligence. Is that possible in the world in which we are living, where one smokes, drinks, kills animals to eat, and so on? Is it possible for a body to be completely so highly disciplined? And that discipline is not imposed by thought but by its own intelligence. It is possible only when one has the right kind of diet. But not to make diet a religion, which is, being a vegetarian, don’t make that into something extraordinarily holy. And this quality of sensitivity and intelligence, physical exercise is necessary. Am I laying down a discipline? No, I don’t think so. And therefore they say you must do yoga – and again one mustn’t make it into a religion – then only you will be highly intelligent, highly moral, highly spiritual. Hitler was a vegetarian, so was Mussolini, and there are a great many yogis who lose their temper at the least provocation, and are full of vanity. But one can see that exercise is necessary – walking, swimming or doing yoga. I was told that word yoga means harmony, skill, not only in action but also inwardly, to have great skill in all action, which is in all relationship. And in doing yoga exercise, it is also necessary to find out and be taught, perhaps, how to breathe rightly, which is called pranayama, so that you have more oxygen in your blood. The speaker does yoga and pranayama every day. It is not a religion; it is purely an exercise to keep the body healthy, vigorous, vital. When the body, the sensory perceptions are extraordinarily alert, sensitive, clear, which can obviously only exist when the body doesn’t overeat, doesn’t drink – you know all those things, which are obvious – then the body, the organism, is extraordinarily alive, sensitive, aware, watchful, and we can proceed to find out how the mind, the brain, also can be vital, alive, highly sensitive. And that very sensitivity, which is intelligence, brings about that quality of silence in which alone you can observe. 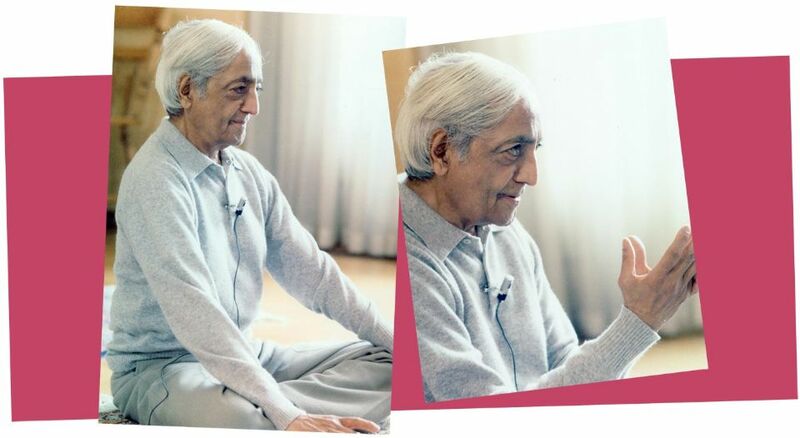 Krishnamurti in Saanen 1969, Talk 6. Yoga, the series of exercises and breathing, was invented many thousands of years ago in India. Yoga is to keep the glands, the nerves and the whole system functioning very healthily, without medicine, and keep it highly sensitive. And the body needs to be sensitive otherwise you cannot have a very clear brain. If you stuff yourself with wine, meat and all the rest of it, how can your brain function clearly? Your smoking and drugs become such superficial immediate satisfactions without any understanding what is beyond. Yoga is not something mysterious. One has to do it to keep the body supple. The brain has to have all the blood it needs, and therefore right breathing. If I may be a little personal, I do it every day for two hours, regularly. Not the regularity of machinery. One has to have very good, healthy, sane body, and therefore a brain that is capable of thinking rationally, healthily, objectively, non-personally, therefore efficiently, and a brain that is absolutely quiet; not mechanically made quiet. You can see the truth of this, the simple logical fact of it, that one needs to have a very good healthy, sensitive, alert body, a brain that functions very clearly, non-emotionally, and for such a brain to be absolutely quiet. Question: If you do yoga every day for two hours, is that not a form of discipline? K: The body tells you when it is tired, the body tells you not to do it that morning. When we have abused the body, driving it to do all kinds of things, spoiling its own intelligence, by a particular food we like, smoking, drinking and all the rest of it, the body becomes insensitive. Then thought says, ‘I must drive it, I must force it.’ Such driving the body, forcing it, compelling it, becomes a discipline, whereas yoga means skill in action, without any effort. Skill in action implies no effort. If any form of effort is involved when you do the exercises, that is not yoga. Therefore you do it easily, and the regularity of it depends on the sensitivity of the body. It is not a mechanical regularity. All this requires a great deal of intelligence, not only the intelligence of the body but the mind and the brain. When there is intelligence it will react, tell you what to do or what not to do. I don’t want to control myself at any level, physically, emotionally, psychologically, intellectually. It is a dangerous thing I am saying unless you understand it very carefully. When there is control there is division, and therefore there is effort and so distortion. So I have to find out how to live without control, without the duality of the controller and the thing to be controlled. Mr Krishnamacharya and Desikachar say if you are doing yoga there must be no effort at all, no forcing the body at all. If you force the body it is not yoga, so to do something without effort. Standing straight without bending the knees, to touch the floor may take a week or longer, but don’t make an effort. The moment you make an effort you are forcing the muscles, therefore the muscles become taut, distorted. Whereas you say, ‘All right, I am going to do this thing very slowly, take time, give attention to it.’ Do it very gently. I want to live a life without any control. The whole of life to be without control, but yet highly disciplined. I see any form of control implies effort. That is the thing first you must understand before you understand meditation. Effort: I must get up, I am lazy, I must force the body, I must go for a walk, it is good for me, I must drive it, I must not be angry – all the musts and shoulds imply control. Control implies suppression, conformity to a pattern, whether that pattern is the social pattern or a pattern which you have developed yourself. Freedom implies freedom, not from something. To live a life which is completely free means no control. Can you live a daily life without any control, and yet be punctual for meals, get up at the right time to exercise, study or whatever you do, without the least effort? Effort implies duality, contradiction, wanting, not wanting, and therefore distortion. So the mind that lives without effort is a mind that has no distortion whatsoever. Unless you really understand very clearly what it means to make effort, what is involved in effort, meditation becomes a process of control and direction. That is not meditation at all. Can a mind be quiet through any system, through any action of will? You can perceive totally, completely only when the mind is wholly quiet. So the professionals, the teachers, the gurus say you must sit in a certain posture, control your thought, breathe properly and so on. So a contradiction takes place because you are in conflict, because you don’t know how to control, how to breathe. What is it that meditation offers according to these people? Enlightenment? Can you be enlightened if you have not lived properly? Can you be enlightened by doing some exercises, listening to a guru, practising a system, when your mind is shoddy, little, petty? Can a mind be quiet through any system, through any action of will? Will is a form of resistance and resistance brings conflict. So can the mind be free totally of all will and yet function in this world efficiently? Sit quietly. Absolutely quiet, without a single movement. Your hands, eyes, everything completely quiet. What happens? While you are coming to the room you have watched the sky, the flowers, you have seen the beauty of the earth, the trees, the birds, the squirrels, you have watched everything around you. When you have watched everything around you then you don’t want to look out anymore; you have finished by looking very carefully at everything as you come in. Then you sit absolutely quiet without a single movement. Then you are gathering quietness without any forcing. Be quiet. Then when you leave carry that quietness. Though you are teaching or you are learning, there is this quietness going on all the time. The real yoga, which is called Raja Yoga, King of Yogas, is to lead a highly moral life. Not morality according to circumstances or according to culture, but true ethical activity in life: not to hurt, not to drink, not to drug yourself, the right amount of sleep, the right amount of food, clear thinking, and acting morally, doing the right thing. They never mentioned exercise, as far as I understand after talking with a great many scholars. They say exercise normally, walk, swim, all that, but their emphasis was a very moral life, a mind which is active. Modern yoga – I don’t know why they call yoga, it should be called just exercise, but that wouldn’t appeal to you! You can practise yoga, the exercises of different kinds. The speaker has done some of it for years. But you can do this kind of yoga exercise for the rest of your life, you won’t awaken spiritual insight, nor will the awakening of a higher energy come into being. In the East they have a word for this, kundalini. I have discussed with them very seriously and what they are talking about is a certain form of increased energy to do more mischief. By eating the right food, by control, by breathing properly, etc., you have more energy, naturally. And that gives you a sense of superiority, that you are enlightened and so on. But when the self is not, there is a totally different kind of energy to keep the mind fresh, young, alive. That can only come when there is absolutely no sense of the self, because the self, the ‘me’, the centre, is in constant conflict, wanting, not wanting, creating dualities, opposing desires, this constant struggle that is going on. As long as that struggle is going on, there is a wastage of energy. When that struggle is not, there is a totally different kind of energy taking place.